I'm sure most of you have heard of Spoonflower, the online design your own fabric (and more) place. I've been lurking there for a number of years, I've ordered fabric from other designers, and the whole time I've really been wanting to design something myself. 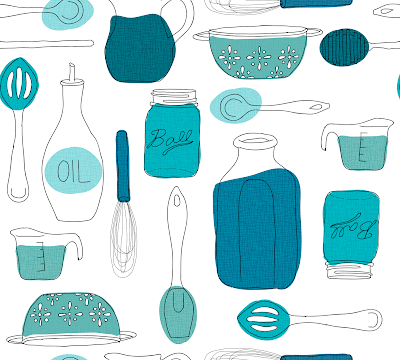 I'm finally getting there, thanks to a Skillshare class done in collaboration with Spoonflower. I actually worked on a different fabric design but decided it wasn't something I actually wanted to print. So I came up with the design below for my trial run. It might look totally hideous, it might not work, the colors might be wonky, or the blips in my design will be totally obvious, but whatever (!) the test swatch is on its way to my house. I can't wait to see it. Once I do I might put it out there for other people to purchase if they so desire. Then I hope to make myself some kitchen towels out of this stuff. Have you ever really needed to just get something done? That's how I felt about this. Waiting, waiting, maybe someday, once I know more, once I have the right tools, the right skills, etc. Sometimes I need to get past the second-guessing myself stage & just complete something to feel free to move forward, make some mistakes, and hopefully get better. I hope to see some more stuff like this around here in the future! Find my fabric on Spoonflower here.